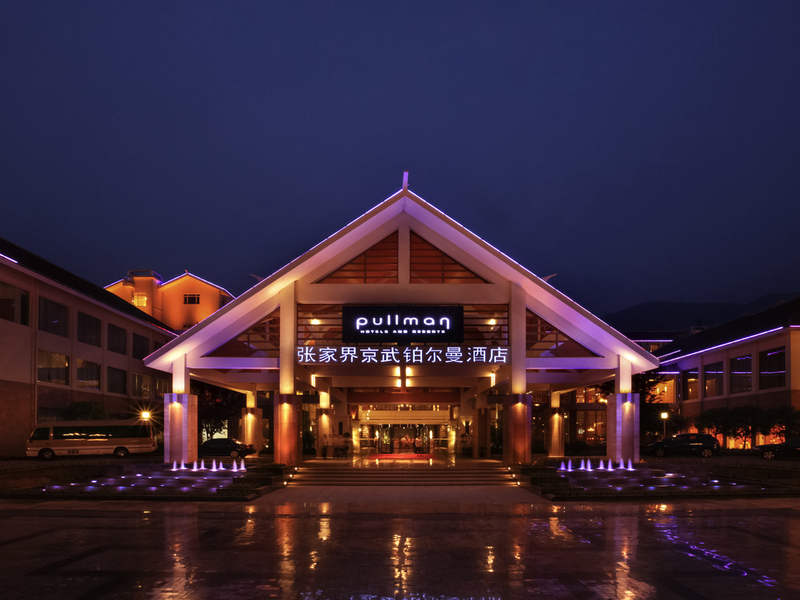 Pullman Zhangjiajie is located in the center of Wulingyuan, the National Forest Park and 5A scenic spot. Nearby attractions include the Zhangjiajie National Forest Park, Baofeng Lake, Huanglong Cave, Zhangjiajie Grand Canyon and Charming Xiangxi Theater. Trendy restaurants and bars that suit all tastes and budgets are within a short walking distance. Strategically located with a 30-minute drive from Zhangjiajie City, airport and railway station, and it takes only 3.5-hour drive from Changsha City. Satisfied as got lot of help from Mr. Bob Naresh, who was one of the reasons we chose this hotel to stay. He helped us in planing for our trip in Zhangjiajie and also with food and other stuffs. Our 3 nights stay was nothing but excellent. Clean rooms, comfortable beds, great service with an extra touch. Great location too and definitely value for money. We will certainly recommend this great hotel to anyone who’s going to tour Zhangjiajie. Got a spacious room, nice bath tub for a hot soak (got to ask for bath salt, though) and rain shower which made for a really comfortable stay during our recent visit over 3 nites. Good breakfast spread - had hot noodle soup every morning because it was very tasty, probably the best so far as compared to those we had in Sofitel (maybe the dan dan noodle in Sofitel Chengdu was equally good), Pullman, Grand Mercure & Novotel in other parts of China over the past few years. Kudos to the chef! Good location too ... just next to Charming Xiangxi theatre and we could enjoy a leisurely walk back along the Suoxi River after dinner at Xipu dining, shopping & entertainment area. Hotel also provides complimentary shuttle to Tianzi mountain entrance gate which is just 5 mins away. We stayed in Pullman Zhangjiajie for five nights. The room is clean and the service is good. There is a counter in the hotel lobby which offers tour services to the national park. We have joined the tour and the guide speaks Chinese during the tour. We are impressed by his service as he is punctual, has good knowledge of Chinese history, flexible and is willing to go extra mile to fetch us to the local restaurants for food. Great especially with the breakfast food that is a wide range selection. Photo are prohibited to be taken at buffet area, it should be acceptable to promote Pullman great breakfast offerings. Could not speak more highly of Pullman Zhangjiajie. Coming from the U.S., I was very worried about challenges of traveling in China without the assistance of Google, Maps, etc., but the Pullman was honestly a life saver. In particular, Bob Naresh, one of the customer service managers, could not have been more helpful. Him and members of his staff sat down with me and gave me specific, step-by-step directions on what I needed to do. Would have been a much more difficult experience without him. Truly a top notch hotel and one of the best I have stayed at any where in the world. Rooms are extremely spacious and high end. I probably slept in the biggest bed in my entire life. You also cannot beat the location being walking distance to the entrance of the national forest parks. Not having to take a car or taxi in the morning to get to the parks was a true luxury (and I recommend going early to beat the crowds). Nice lobby bar was well to spend a few hours in the afternoon and unwind after the day. A real 5 star experience. The hotel is located in a perfect location. The room was spacious; however, I found some small bugs in my room and the heater was not working well. The staff is friendly and pretty responsive. It would be much easier for us if the staff could speak better English. the room is very clean and the staff is very kind. Basically, the stay is very nice. Strongly recommend the restaurant downstairs, it's very delicious. The water in the hotel is very very clean and the kettle as well, which is above my expectation. However the air condition is not good, still feel cold in the room. The bathtub is not very clean. And the phone in our room is broken. I have to go to the bathroom to pick up the phone. Besides of that, the room decoration seems kind of old. oh, I have also to mention they have out-door swimming pool... Can't use it during winter. It was easy to check in. Staff were helpful. The only thing that would have made it better would have been a heated pool with winter access. Very good experience in Pullman hotel with the great service, superb room quality and worth for money. We got the great service for reception staff, the room is extremely perfect. breakfast is good ,price is not expensive, worth for money. We were happy with the room which was large with an extremely good size super King bed. We had an enjoyable and comfortable stay ans enjoyed the delicious spread at breakfast. The stay was smooth and above our expectation. Everything was to the point. We were relieved that Mr. Bob Naresh was there to help. He helped us in the planning our trip to Zhangjiajie. The weather was good. The allocated room is big and spacious. The size of the bed is great for families with kids. A nice stay but hotel in need of a bit of care. Disappointed to find the pool is out of bounds in November. Good location for Wulingyuan entrance to the National Park (walking distance). Level of English spoken at reception not very good; concierge was able to help. Breakfast was good. Hotel exterior decor in need of improvement. I was on floor 6 of block 3 which was supposed to be non-smoking but the corridors smelled strongly of smoke. Asking for a beer at the bar in the middle of the afternoon seemed to be a major request that staff weren’t ready for. Great property and most excellent staff. Great overall experience and had a most amazing stay at the property. The property is in great location and staff is even better. Bob Naresh took most extra ordinary care of us during our stay. He is most courteous, professional, helpful and exceeds all expectations. Definitely recommended to stay here and ask for him for any assistance, he will take great care of you. Staff is accommodating. They arranged for early breakfast take-away at 5:30am as we needed to head out to the airport early to catch a morning flight. They also arranged for me to use their Connectivity Lounge to do our online check-in as I cannot access the airline website using my phone. The rating is not a perfect 10 because water is leaking from our shower area to the bathroom floor, an inconvenience, but quite understandable. Hotel staff was good, cleaning staff was friendly, there were bugs in the room. The overall experience was fine, the hotel staff was mostly courteous for in-hotel questions. They were less helpful for helping about transportation to another city. On more than one occasion, there were huge wasps inside, but the cleaning staff were helpful in removing the pests. The low point of the stay was the on-site travel agency in the hotel. The staff there attempted to get the hotel receipt for our stay for unknown reasons. They also seemed to have fairly easy access to the front desk's copy of our documentation. I have no way of knowing if my identity was stolen. Located close to the park and that was a great advantage as we travelled there during Golden Week.Room was big and clean.Ate at restaurant a couple of times and staff were helpful as we did not speak Mandarin.Biggest annoyance is that the hotel still allow smoking within the hotel especially near the pool where we could see ashtrays and cigarette butts. At times the elevator smelled of cigarette smoke. Accor need to rectify this issue !